...and so it begins. Soccer on Sundays. Practice on weekdays.Ten weeks. Traveling. Drinks to hydrate. Snack schedule. Smelly cleats. Sweaty uniform. Exhausted children. Exhausted parents. But enough of the complaining already. This stuff is fun! Yesterday's game was a bit slow to start. Both teams held each other from getting a goal. That is until one of our players shot a direct kick over the opponents and scored. Unfortunately, I missed that shot on my camera. I was busy checking my tweets (hangs head in shame). He would go on to score two more goals, which I DID catch on camera. 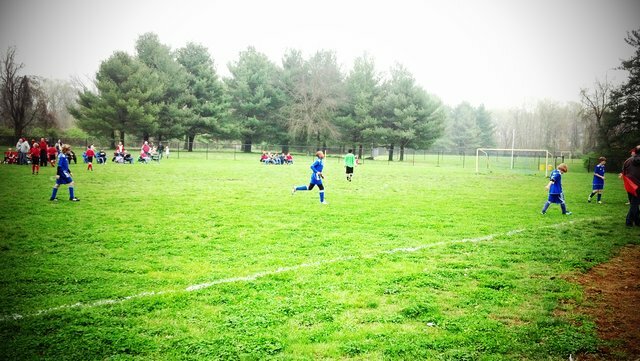 Kaden scored as well. My position on the field wasn't the best. I'm not a professional videographer. I just like recording to catch those unexpected moments. Youth sports can turn from good to bad in an instant. Fortunately, this game was executed perfectly. Kudos to the referee. I did, however, capture a few other clips from the game on my phone. The quality isn't the best and the camera decided to act a bit wonky, but the overall spirit of the game can be felt. Check out the guys score their way to a 4-0 victory. I'm taking a different approach to soccer this year. Normally I am the one recording video., so you rarely hear me screaming. Watching old footage and hearing myself sound completely ridiculous has made me reflect a bit on my actions at the games. There's also another reason. I'll have to write a post all by itself for this topic. Until then, check back for more updates on Soccer Sunday.